By Dr. Abdul-Azeem Badawi. 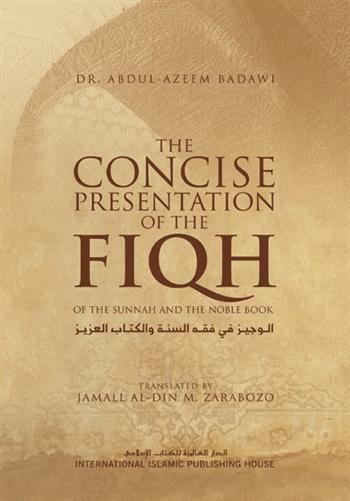 There are now a number of introductory compendiums of fiqh available in various languages. However, this particular work has unique aspects that have made it a popular work in its native Arabic language and which should make it, Allah (SWT) willing, an important contribution to the Islamic literature available in English. For example, the author has restricted his foundations for fiqh to the Quran and the authentic hadith of the Prophet, painstakingly avoiding any of the weak and rejected hadith that are found in the majority of the books of fiqh. To further ensure that this work is of the utmost reliability, the author has also restricted his discussion to what is most directly derived from the Quran and Sunnah and, therefore, logically above dispute. International Islamic Publishing House (2007), Hardback, 702 pages. Dr. Abdul-Azeem Badawi is a well-known imam, preacher, writer and Islamic lecturer in topics such as tafseer (Qur’an commentary), Hadith and fiqh (Islamic jurisprudence). He was born in Egypt in 1373 H/ 1954 CE, and studied at al-Azhar University in Cairo until he completed his doctorate. He has lived and worked in Egypt except for 11 years that he spent as an imam in Jordan, where he had a close relationship with Shaykh Muhammad Nâ?ir ad-Deen al-Albâni.